Talk Triggers is the definitive, practical guide on how to use bold operational differentiators to create customer conversations, written by best-selling authors and marketing experts Jay Baer and Daniel Lemin. Word of mouth is directly responsible for 19% of all purchases, and influences as much as 90%. Every human on earth relies on word of mouth to make buying decisions. Yet even today, fewer than 1% of companies have an actual strategy for generating these crucial customer conversations. Talk Triggers provides that strategy in a compelling, relevant, timely book that can be put into practice immediately, by any business. Combining compelling stories, inspirational examples, and practical how-to, Talk Triggers is the first indispensable book about word of mouth. It’s a book that will create conversation about the power of conversation. Customer service is the new marketing. In Jay Baer’s new book Hug Your Haters (available now, released March 1, 2016) readers learn how to embrace complaints – all of them – and use this critical feedback to improve their businesses, and keep their customers. Hug Your Haters is the new playbook for how businesses of all sizes must handle customer complaints in a modern, mobile world. when choosing to answer haters’ criticisms. Hug Your Haters proves that approach to be a costly mistake. 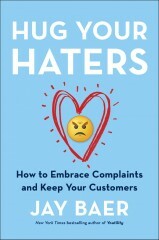 Centered around proprietary research into the how, where, and why we complain, Hug Your Haters demonstrates that there are two types of complainers, each with very different motivation, and provides the step-by-step playbook for how to handle them successfully. The first Convince & Convert produced book, Manipurated is available now, and released December 1, 2015. Manipurated is a business owner’s manifesto that exposes the inner workings of the multibillion-dollar online rating-and-review industry, and shows them the roadmap to making these platforms work harder for their businesses. This book hits home for the 30 million businesses in America that depend on ratings and reviews for customers. Few business owners understand that amazing businesses can be permanently damaged with a few bad reviews. Managing a reputation online requires skills and tactics that are not always intuitive to business owners. Manipurated gives business owners an insider’s view of how the multibillion-dollar ratings and reviews machine systematically stacks the cards against them ― and more important, empowers business owners to fight back with a six-step playbook to defend, control, and enhance their business’s online reputation. Manipurated is a must-read for all business owners who depend on online reviews. Jay Baer is the founder of Convince & Convert, and his book Youtility: Why Smart Marketing is About Help not Hype is a New York Times and Amazon best-seller that started a world-wide marketing and business movement around helpful content marketing. The premise is simple: What if your marketing was so useful that people would pay you for it, if you asked them to do so? Youtility – creating marketing that is truly, inherently useful, is the first big umbrella marketing platform of the age of social and mobile connectivity. The Youtility keynote presentation draws RAVES from audiences worldwide, because it’s thoughtful, practical, impactful, and funny. Jay Baer inserts examples from attendees in the room to make Youtility even more relevant. 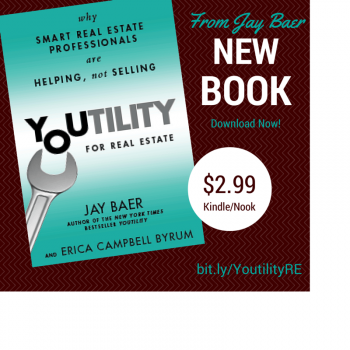 Jay Baer’s new book is Youtility for Real Estate, devoted to teaching real estate professionals how differentiate with help, not hype in today’s hyper-competitive business environment. Chock full of case studies and amazing examples, Youtility for Real Estate is the marketing bible for creative real estate professionals. Just $2.99 as a digital download. Jay (and his co-author, Erica Campbell Byrum from Homes.com) are touring the USA and beyond speaking with real estate organizations about making their marketing incredibly useful. Youtility for Accountants – is now available as an Amazon Kindle, Barnes & Noble Nook, Apple iBooks and Google Play digital book exclusive. Youtility for Accountants takes the core premise of Youtility – making your marketing so useful, people would pay for it – and gives it an accountants-only twist. If you think all accountants are the same, this book will show you how creating marketing that contains real value is the path to success for accountants and accounting firms. This book was written by Jay Baer and Darren Root, co-author of The E-Myth Accountant. What is social media’s impact on business, and how must companies change to survive and thrive in this fast-paced, hyper-competitive world? This is the topic of The NOW Revolution: 7 Shifts to Make Your Business Faster, Smarter and More Social from Jay Baer and Amber Naslund. Every customer is a potential reporter, and every employee is a potential spokesperson. Business has changed more in the past three years than in the prior 30. But it’s not a threat, it’s an opportunity.The NOW Revolution shows you how. This book isn’t about how to “do” social media. Instead, it outlines how you can retool your organization to capitalize on real-time business. Learn the seven shifts that make your company faster, smarter, and more social, each explained with case studies, useful tips, and actionable implementation advice. The NOW Revolution is a transformational keynote presentation, because it puts social media into a historical, cultural and operational context that businesspeople (even execs and non-technical types) can understand, appreciate and implement. For more information on keynote presentations of these books, or for bulk orders and/or book signings please Contact Us or visit the JayBaer.com site. Talk Triggers is one of the best marketing books I’ve ever read. Highly, highly recommended. Wow! Unlike other books that are more conceptual, the Talk Triggers framework offers specific prescriptive guidance for creating a marketing flywheel.